1Put a big pot of water on to boil, and cook the spaghetti. Meanwhile, heat a drizzle of oil in a heavy skillet and saute the onion for about 5 minutes, until golden. Add the garlic and cook for a few more minutes. 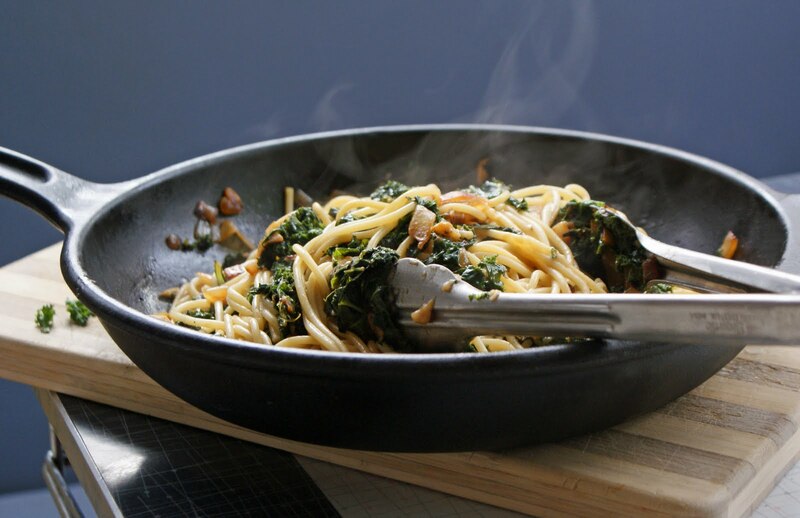 2Rinse the kale, pull out the tough ribs and coarsely chop or tear apart; add another drizzle of oil and then the kale to the onions and garlic. Add about 1/4 cup of the pasta water, straight from the pot, to the pan as well. Cover, reduce the heat to medium-low and cook for about 10 minutes, until tender. 3Drain the spaghetti, reserving a bit of the cooking liquid. Add the spaghetti to the kale mixture. Add lemon juice and a few spoonfuls of the reserved cooking liquid; toss to combine, adding a handful of Parmesan cheese and more liquid by tablespoonfuls if it's too dry.